I feel sick. 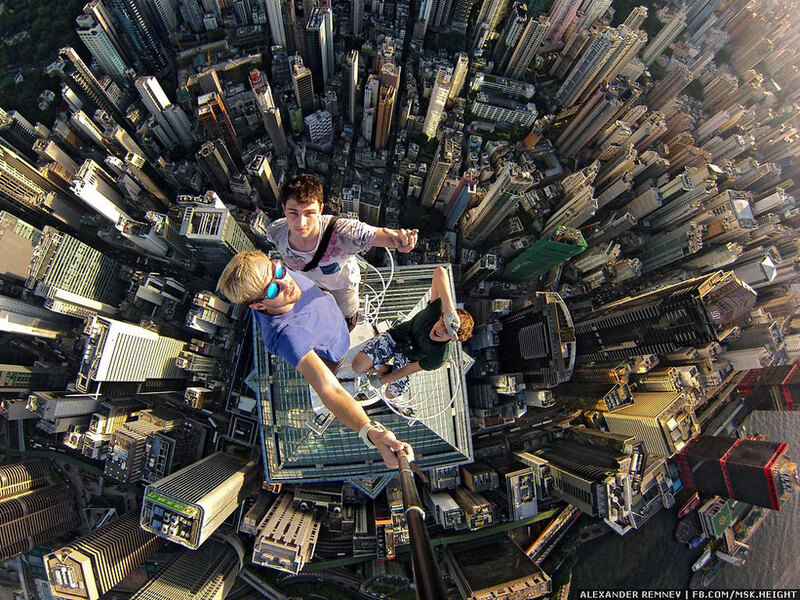 My hands are getting wet and my stomach just dropped while I was watching a video of Alexander Remnev, showing him on top of a skyscraper and taking selfies in daring positions. Within days, the images of the Russian guy went viral. 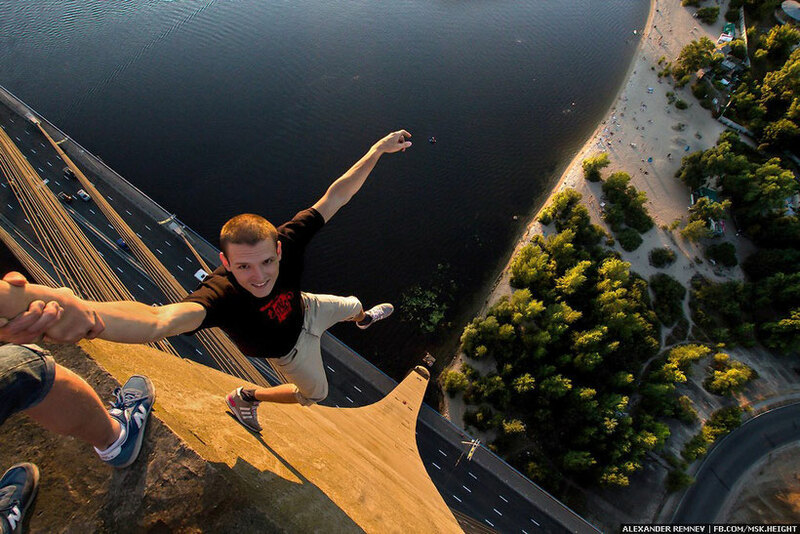 Who is this crazy daredevil? Alexander Remnev is a nineteen-years-old guy from Moscow. 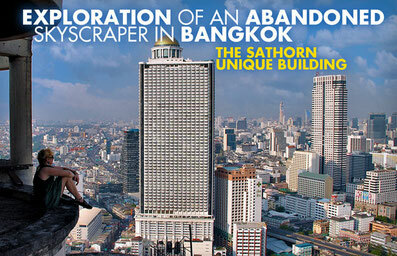 He has been climbing on rooftoops since the tender age of 14. The photographer traveled to Hong Kong, Paris, Barcelona, and Dubai... just to find tall buildings and make his way up to the roofs of these skyscrapers. I started following Alexander on Facebook since I saw the first images of him a couple of months ago. My heart skipped a beat, every time he posted a new image from an incredibly high altitude. His photos and videos are amazing and frightening at the same time. Definitely nothing for the faint hearted. 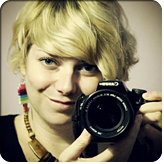 I emailed Alexander, telling him that I want to feature his images on my blog. He replied in no time, telling me that he has managed to gain access to many rooftops around the world. And he is still not done. Please do not replicate any of those stunts. 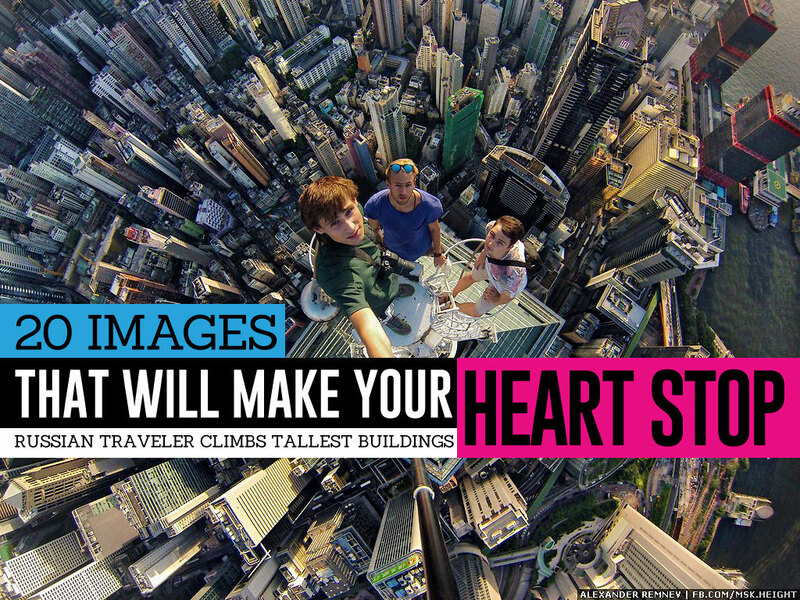 Climbing on top of a skyscraper is extremely risky and dangerous for your life! Alexander traveled with friends to Dubai to scale several skyscrapers in the city. 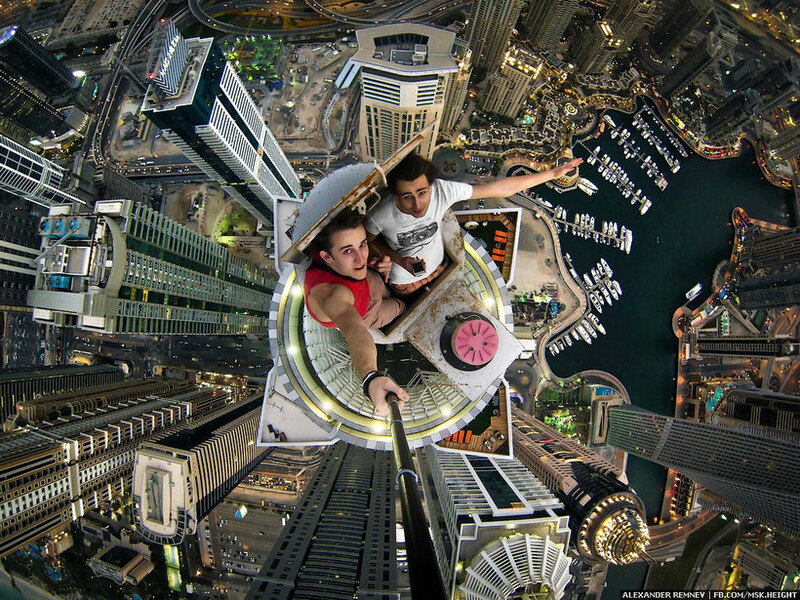 The image above shows him with a friend on top of the Princess Tower, the world's tallest residential building. 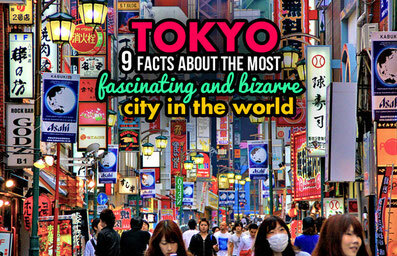 The tower is a 101 storey and 414m (1,350 ft.) tall. 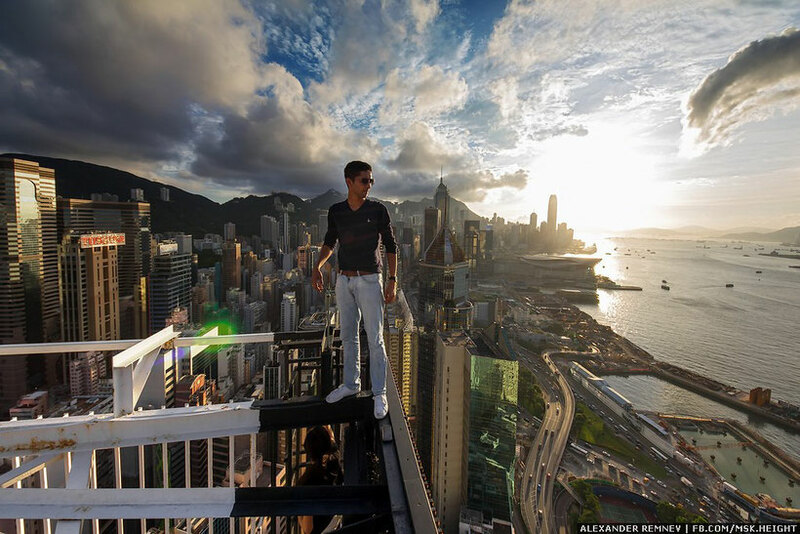 Rooftopper Alexander in Hong Kong, balancing along a skyscraper without ropes or any safety gear. 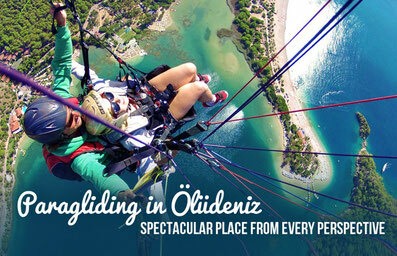 Scared of high altitudes? I doubt it. "Over the years, I lost my fear of heights" he says. 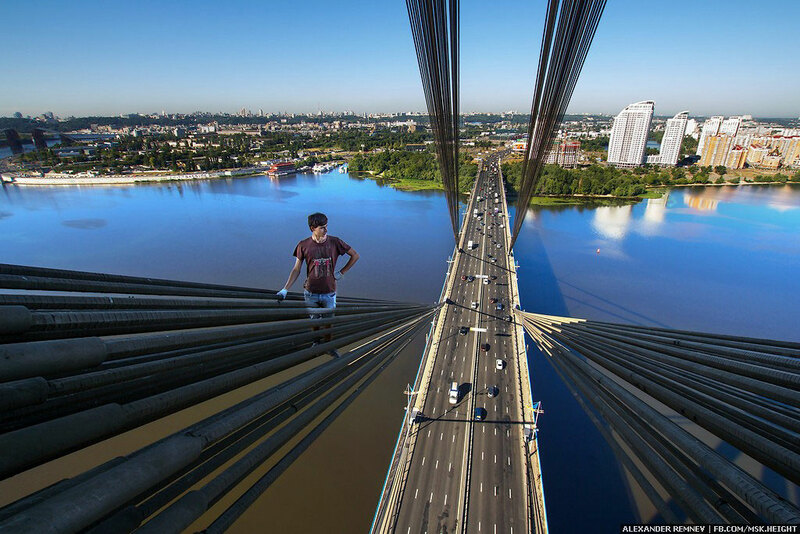 Mustang Wanted, another popular skywalker and friend of Alexander is hanging on the edge of the Moscow Brigde in Kiev, Ukraine. Just by looking at this, my palms get sweaty. 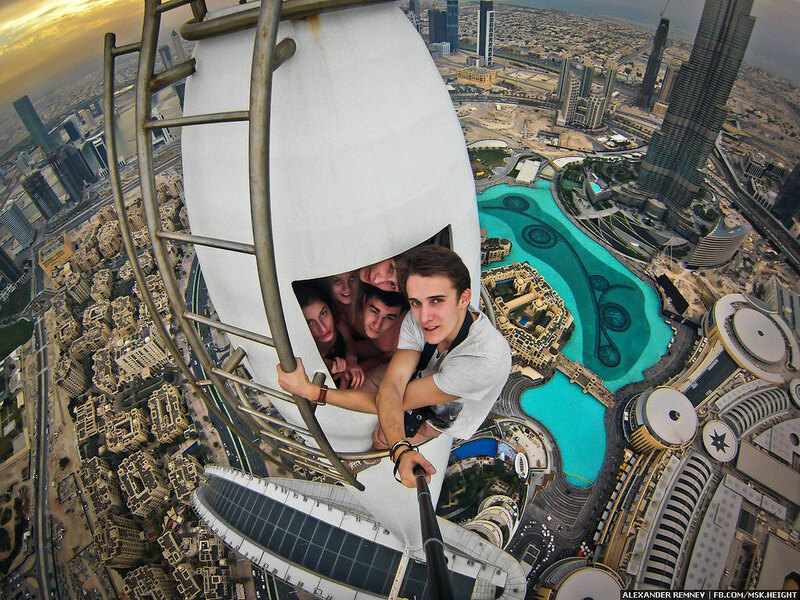 Alexander climbed with friends to the top of the Address Hotel in Dubai... 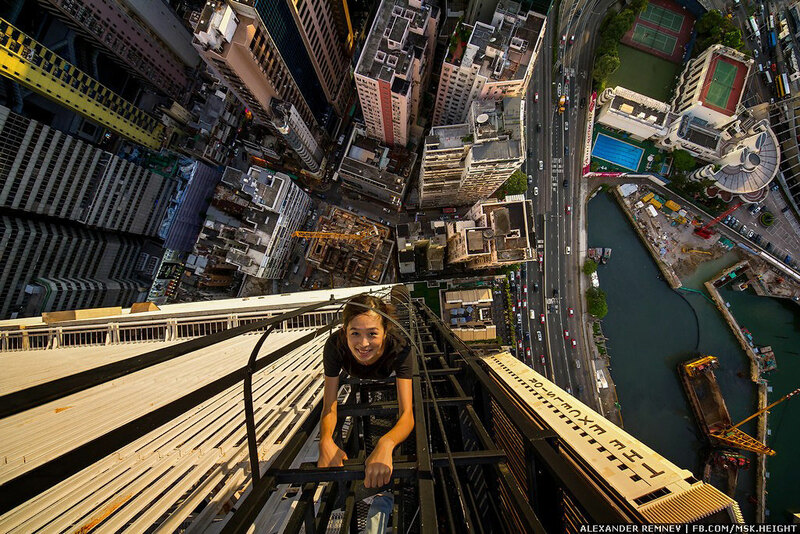 The thrill-seeking teenager scaled several skyscrapers in Dubai, without any problems to get in. "We walked around in Dubai and looked at random skyscrapers. We just tried to get up. When there was no access, we moved on to another building. But we were lucky, most of them were unlocked..."
On the very top end of the Torch Tower, one of the world's tallest residential tower and an iconic part of Dubai Marina. 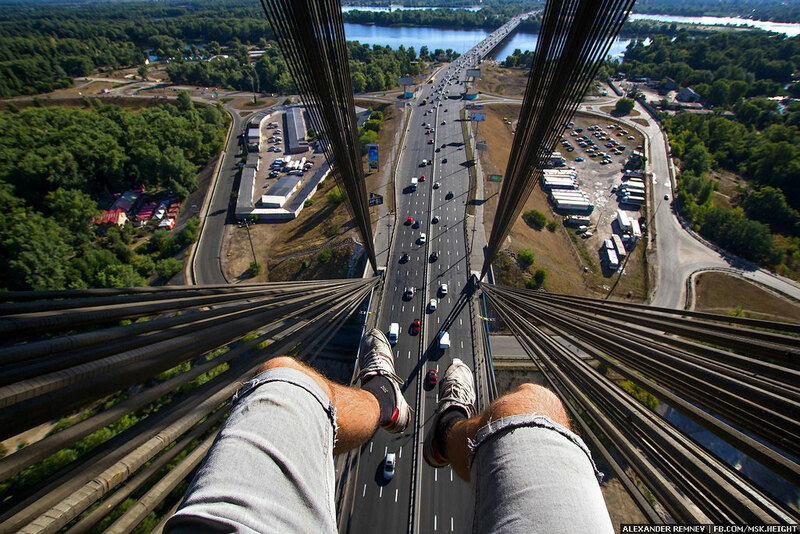 Jaw-dropping: Alexander on his way up to the Moscow Bridge in Kiev, Ukraine. Fearless girl sitting next to the edge of Cayan Tower, showing an amazing night view of Dubai. If you don't live on the edge, you can't see the view. 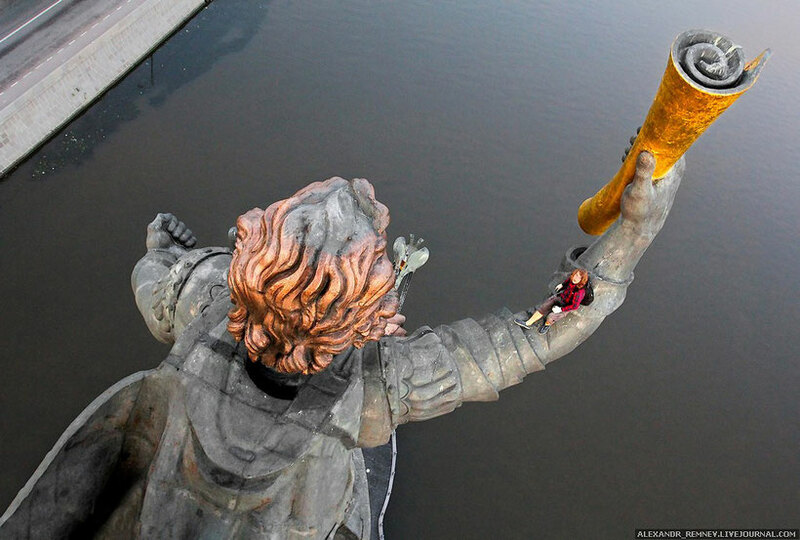 Walking on Peter the Great, a 98m statue in the Vodootvodny Canal in central Moscow, Russia. 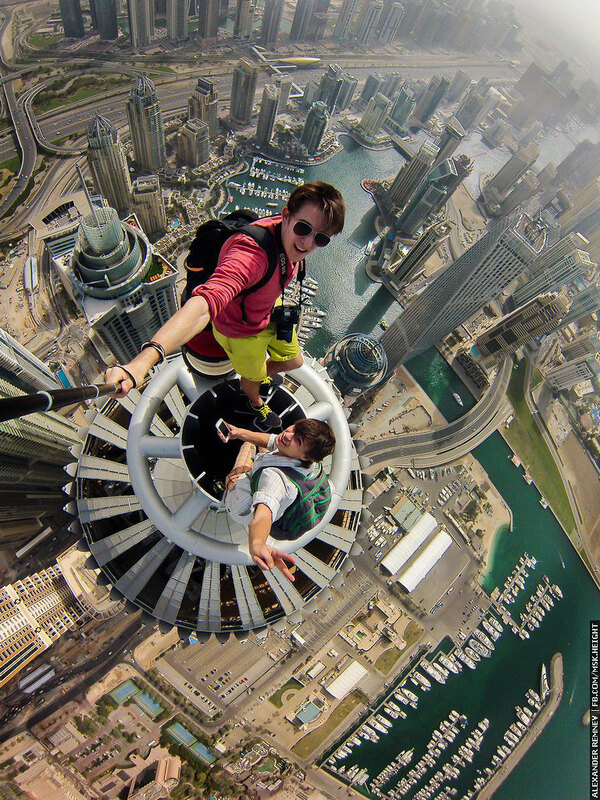 Alexander scaled the Millennium Plaza in Dubai - before getting his GoPro out to take these stomach-churning images of Dubai. The typical foot selfie, after conquering the Moscow Bridge in Kiev, Ukraine. 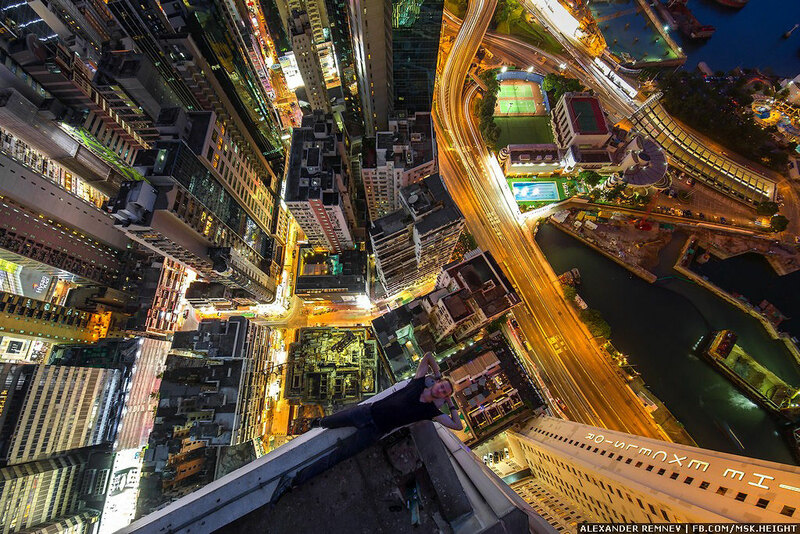 "In some cases, it's more difficult to climb down than up..."
Dangerous thrill: Getting a dizzying selfie over the skyline of Hong Kong. Crazy Russians? We couldn't agree more. But we love his pulse-pounding images. 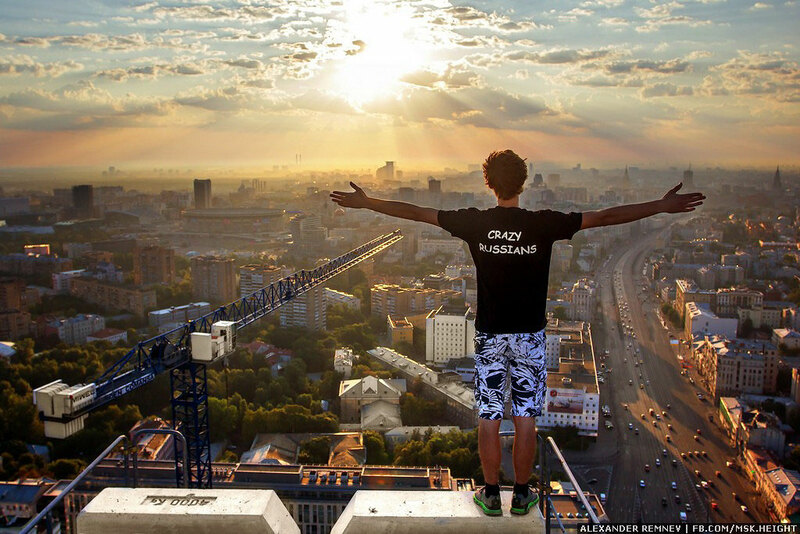 Skywalker Alexander in his hometown Moscow, Russia. 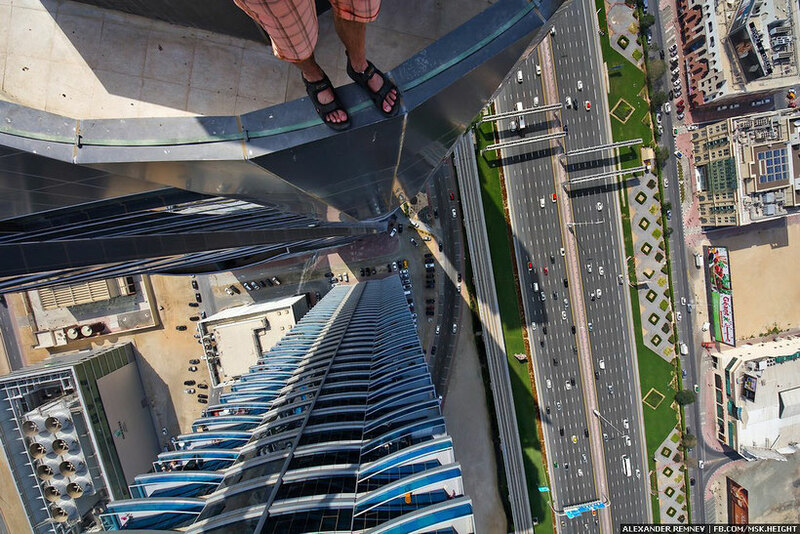 Bird's eye view: Another stunning shot from one of Dubai's skyscraper by daredevil Alexander Remnev. 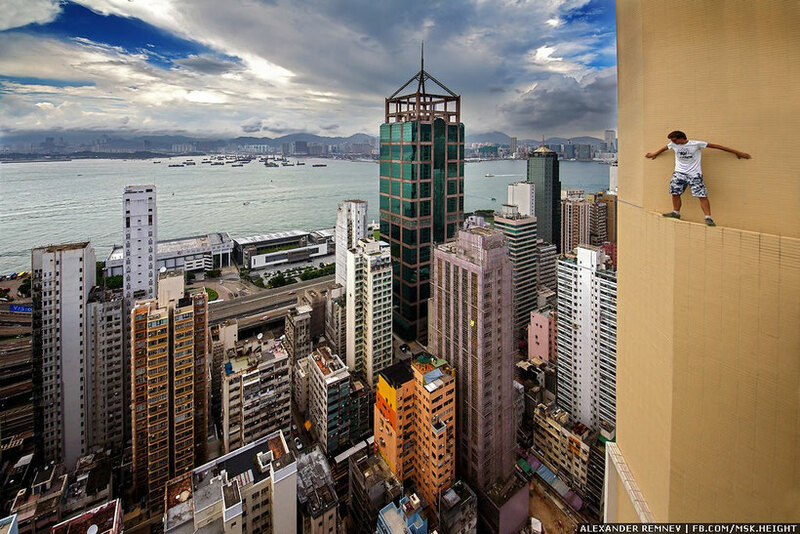 Breathtaking view: Fearless rooftopper standing on highest point of a skyscraper in Hong Kong. Be brave, click that play button! Not sure about you, but I got my full adrenaline fix today. 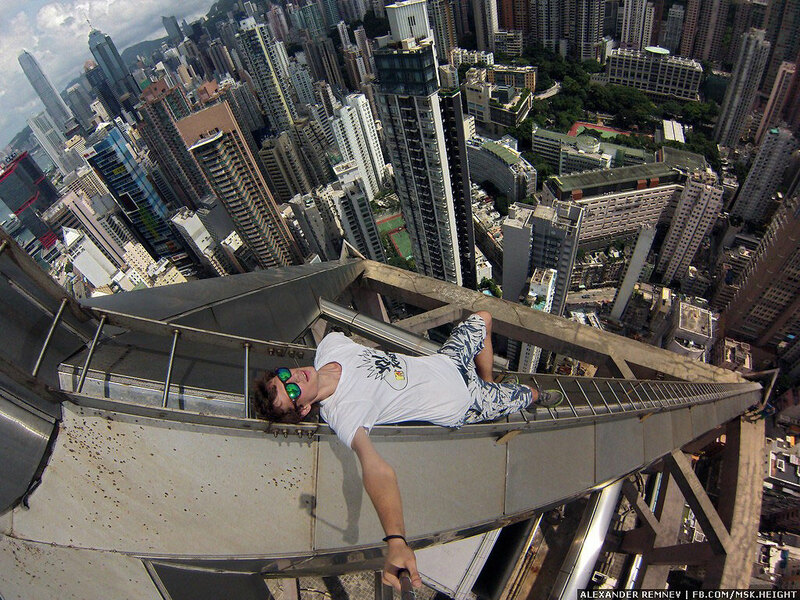 Do you think it's worth the risk to scale skyscrapers to get the ultimate selfie? If you got addicted to Alexander's images, you should follow him!